Isatis tinctoria is a plant native to Russia and introduced worldwide (McConnell et al. in Sheley and Petroff 1999). A conservation status rank is not applicable (SNA) because the plant is an exotic (non-native) in Montana that is not a suitable target for conservation activities. PLANTS: Typical biennial forbs. Stems are erect, simple, and 30–100 cm tall. Plants develop a taproot and several lateral roots. The taproot can be 3-5 feet long to access deeper water sources. Within the upper 12 inches of soil, several lateral roots grow outwards to access shallow water sources. LEAVES: Basal leaves form a rosette where blades are blue-green, petiolate, oblanceolate, 5–18 cm long, and with entire margins. Stem leaves are arranged alternately. Stem leaves have blades that are blue-green, lanceolate, sessile, and clasp the stem (auriculate). Vestiture hirsute with simple hair at the stem base, otherwise glabrous. INFLORESCENCE: Yellow flowers are clustered in racemes on upper parts of a branched stems (panicle). At maturity flowers appear bright yellow with a hint of chartreuse green. Sources: McConnell et al. in Sheley and Petroff 1999; Lesica et al. 2012. The genus Isatis comes from a Greek word used for a dye plant (FNA 2010). Flowers April through June. Fruits June through July. See also General Description and Reproductive Characteristics. Unlike most mustards, the fruits of Dyer’s Woad do not split open to expose the seeds, but rather fall intact. Basal and stem leaves have a cream-colored midrib on the upper surface. Dyer’s Woad is native to southeastern Russia, but has been transported to six continents because of its many uses (McConnell et al. in Sheley and Petroff 1999). Early colonists brought it to North America as a textile dye crop where its seeds contaminated other crops. In the western U.S. it came from Ireland to California as a contaminant in alfalfa seed. In 1910 it was introduced in Utah as a contaminant in alfalfa seed. In 1934 it was documented at the pharmaceutical garden near the University of Montana, Missoula, Montana (www.pnwherbaria.org). The species has been introduced and naturalized throughout the intermountain U.S. (Lesica et al. 2012). Prior to the era of Christianity, Dyer’s Woad was believed to have medicinal benefits (Varga and Evans 1978). Ancient warriors made a blue extract from its leaves and painted their faces to look more fierce in battle (McConnell et al. in Sheley and Petroff 1999). In Europe and the U.S. it was cultivated for its dye properties (McConnell et al. in Sheley and Petroff 1999). Roadsides, fields, pastures, grasslands, sagebrush hillsides, prairies, railroad embankments, waste areas (FNA 2010). Valleys in Montana (Lesica et al. 2012). 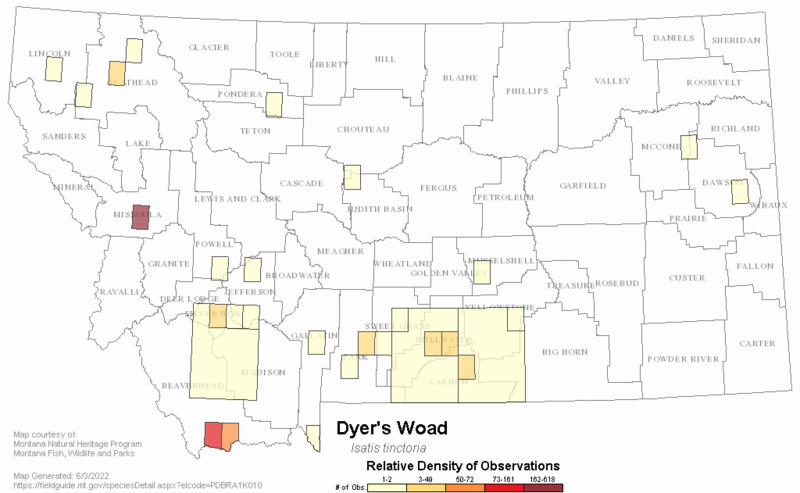 Dyer’s Woad threatens rangelands, forests, and pastures in the Intermountain West because it is able to dominate plant communities (McConnell et al. in Sheley and Petroff 1999). It thrives on rocky soil with limited water-holding capacity, begins growth in the early spring, grows fast, produces a large quantity of seeds, and has an extensive root system (McConnell et al. in Sheley and Petroff 1999). It rapidly transitions from rosettes to flowering plants. One study found growth in April and May averaged 4 inches per week (McConnell et al. in Sheley and Petroff 1999). Unlike many weeds, Dyer’s Woad colonizes and encroaches habitats that are well-vegetated, not grazed by livestock, and/or not disturbed (McConnell et al. in Sheley and Petroff 1999). Fruits likely contain allelopathic substances, though the chemical has not been identified. Studies have demonstrated that the chemical is water soluble and can leach from the fruit to inhibit germination and seedling growth of itself (other Dyer’s Woad plants), several mustard species, and many other plants. Fermenting of the basal leaves and lower stems creates a blue dye (woad) (FNA 2010). Composed of 4 yellow sepals and 4 yellow petals. Petals are 2.5–3.5 mm long. Each flower produces a teardrop-shaped silicle (fruit) that hangs from a small stalk, 6-10 mm long. Silicles are brownish-yellow, narrowly oblong, winged, blunt-tipped, flattened, 12–18 mm long, and lack a septum. The style is lacking. Seeds are mostly single, but occasionally a second seed is produced but is not viable. Dyer’s Woad can act as a winter annual, biennial or short-lived perennial; however, in Montana it typically is a biennial. In the spring seeds germinate, growing into rosettes. Rosette formation and leaves can begin growth a week after snowmelt. By winter rosettes have withered and dormant buds have developed on the root crown. Upon a cold period, rosettes will bolt from the buds in spring (April to May) and flower. Stems and inflorescence growth can begin two weeks after snowmelt. Seeds ripen from June to July and the plant then dies. If environmental conditions are not conducive for seed production then plants will remain as a rosette for two or more growing seasons. Plants that persist for two growing seasons tend to develop larger rosettes, larger flowering stems, and more seeds. Plants (about 1%) that germinate in the fall will flower by spring (winter annuals). Rosettes can produce up to 20 stems, but fewer than 8 stems will flower and fruit. Plants can produce 350-500 seeds, but individuals producing more than 10,000 seeds have also been found. Plants spread by seed; however, one study found 95% of the winged fruits fell within 22 inches of the parent plant. Dispersal distances up to 8 feet have been observed. Another study found that most seeds were shed from plants within 10 days from maturity. Some fruits will stay on plants into winter, and are mostly dispersed by wind and rain. Other long-distance dispersal mechanisms include vehicles, flowing water (fruits float), birds, and contaminated feed, bedding, and crop seed, and the movement of seed infested soil. The fruit pedicel (stem) can also hook onto clothing, fur, and other surfaces. Successful management seeks to prevent infestations and to inventory land annually to detect occurrences early. Hand-pulling is very effective for containment or control because plants are easy to identify and easy for volunteer groups to remove. It works well in difficult to reach areas, like fence rows, and in difficult or sensitive areas. Pulling sessions should be timed with approaching full bloom. The entire plant and taproot must be removed to prevent re-growth. A follow-up session should occur 3-4 weeks later to pull any plants that re-grew or that were missed from the first session. Plants should be bagged and burned or be allowed to fully desiccate before disposing in the landfill. Plants with green pods are capable of germinating. Several examples in Montana, Utah, and other places have shown the effectives of hand-pulling in areas as large as 62 acres over an 8 year period. The level of effort required also diminishes with time, even after one treatment. Mowing done during the flower bloom stage (before fruit development) will reduce seed production and may increase plant mortality. Cultivation: Tillage works to reduce Dyer’s Woad in fields planted with annual or row crops. Seedlings that emerge after tilling cannot bolt and mature until after they undergo a cold period. Herbicides in combination with tillage can remove late emerging plants. Alfalfa crops that are not irrigated can be cultivated in the spring with a flex-tine harrow. A combination of crop rotation, tillage, and herbicide treatments should be used where Dyer’s Woad has infested alfalfa fields. The most effective herbicide treatment to control Dyer’s Woad is Metsulfuron (0.75 ounce per acre) or Chlorsulfuron (1.0 ounce per acre) combined with 2,4-D (3 pints per acre). Using either Metsulfuron or Chlorsulfuron also requires applying a nonionic surfactant. The herbicide mixture should be applied to rosettes and stems up to the late bloom stage in order to prevent seed set and viable seed production. On its own 2,4-D will kill rosettes, but when applied to flowering plants it will not prevent seed production. Imazapic (8-12 ounces per acre) with methylated seed oil (MSO 1 quart per acre) will kill rosettes or bolting plants. Alternatively, flowering stalks could be removed manually (and bagged) and their rosettes and stem herbicided. A study in Utah found that sheep ate at about 16% of Dyer Woad plants and about 39% of the leaves on rosettes up to May 18th. Afterwards, sheep selected other plants. Puccinia thlaspeos is a native rust pathogen that infects Dyer’s Woad plants and prevents seed production. Studies have focused on abilities to inoculate this rust into Dyer’s Woad populations and on the interactions among rust, herbicides, and plants. Contact information for local county Weed District Coordinators can be found on the Montana Weed Control Association Contacts Webpage. Flora of North America Editorial Committee, eds. 2010. Flora of North America North of Mexico. Volume 7. Magnoliophyta: Salicaceae to Brassicaceae. Oxford University Press, Inc., NY. 832 pp. Jacobs, Jim, and Monica Pokorny. 2010. Ecology and Management of Dyer's Woad (Isatis tinctoria L.). August. U.S. Department of Agriculture, Natural Resources Conservation Service, Bozeman, Montana. Sheley, Roger, and Janet Petroff. 1999. Biology and Management of Noxious Rangeland Weeds. Oregon State University Press, Corvallis, Oregon. 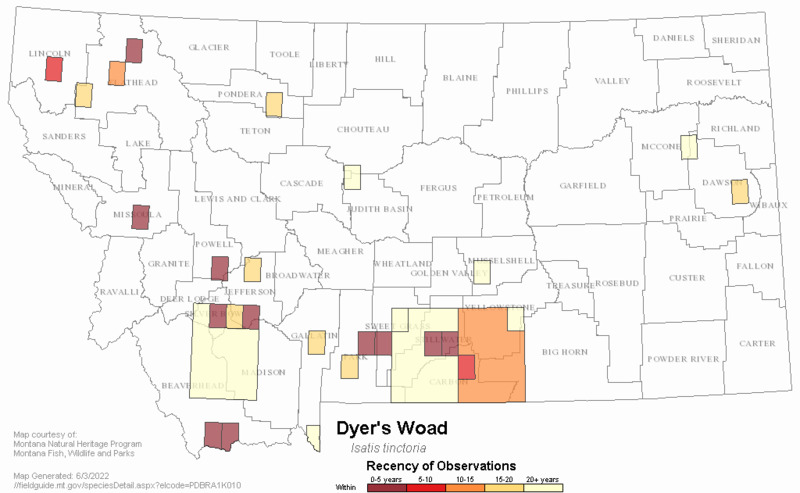 Web Search Engines for Articles on "Dyer's Woad"